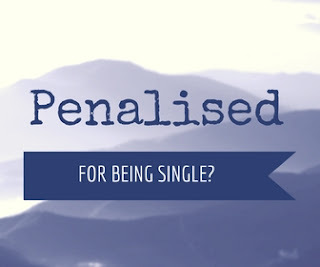 This is another guest post that I'm delighted to share and it looks at discrimination against single people when it comes to things like car insurance. I think it really highlights our assumption that the whole world is paired off into neat little heterosexual couples and maybe we need to start questioning that assumption. It also gave me the idea to have a regular 'rant' feature because we all need a space to let off steam. If you would like to contribute, just let me know! 'Can anyone tell me why, in a time when it is pretty much accepted that it's unreasonable to discriminate against people, single people are apparently the exception. Every time I've turned on the radio this week, I've been faced with the Supervalu advert telling me that if I add my partner to my car insurance, I'll get a 25% discount. While that may be a nice offer for many of you, for me, it's yet another penalty for being single. I manage the costs of running a household alone, all the bills, the rent, the heating, the electricity are all on me. Now, to make things worse, I'm told that if only I had a partner, I would pay almost €200 less car insurance. But apparently it's ok to discriminate on grounds of relationship status. Probably the company is patting themselves on the back, hoping to poach customers from other insurers in a market where shopping around is now essential just to stay on the road. As a single mum, I totally agree with you. There are so many things that are cheaper for couples with children. Quite often, single parents are financially worse of as it is, why put an even bigger strain on them? I do agree, single people are an easy target, the world still thinks households are made up of couples. I have never thought it about before, but you make a very good point. It must be incredibly frustrating and as you point out is everywhere on adverts etc. It seems to be a running theme that if you add your partner to stuff or if you do joint things with your other half you'll get rewards etc... and it's not fair to those who are single at all. It really does need to change. You know what? It's something I never think about, but it's totally true! I understand giving discount on 2nd car, 2nd insurance, 2nd this and that because you're bringing in new custom, but it shouldn't be due to an intimate relationship... Definitely an interesting topic, and my ignorance to it kind of shows how as the non-discriminated party it might be difficult to see the discrimination! A response to the Trump video, we've had enough!